Linda: "Sometimes I'd feel very old, like my whole life is over, like I'm not around no more." The child actor in this was atrocious as were the voice overs. Terrence Malick always gives you beautiful movies to look at but he doesn't always make good movies to go with the cinematography. The locus part was amazing and was by far the most interesting thing that happened in the movie up till then. There is so much joy and pain when you watch his movies. An so much reward as well. 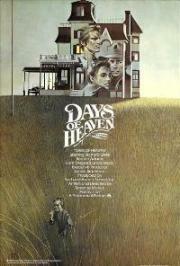 While Badlands keeps up its romantic depiction of the characters even as Kit goes on his killing spree, Days of Heaven wastes no time digging into the deepest flaws of its main characters. Visuals are gorgeous beyond words. The film is quite definitely pretty and has a wistful quality to it that adds more to the film than the characters do. Similar themes as Badlands are resonated here where the focus is more on the sense of being in the environment and less about our worldly stories. Unforutanely, that for me is not moving or inspiring enough as I feel this sense powerfully walking at dusk through the streets or the parks in the north. The film does that have that much of an impact for me. Malick gives a clear perspective on the universe. Many poetic visuals that paint this interconnection between nature, civilization, and even technology to an extent. The voice-over is significant to the natural atmosphere of this film despite Linda being distant from the main story. I appreciated the religious remarks and it's wonderful imagery. There are definitely scenes that create this dream-like state, and depending on the viewer can arouse different sensations. Beautiful.